Ah, the oldest of the Signatory mini set's six whiskies: Bladnoch. Almost 17 years old! 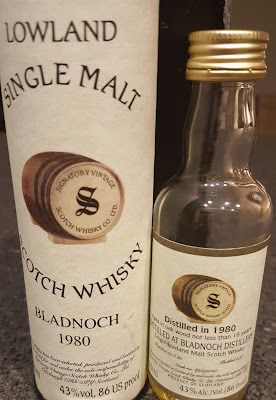 I've had split luck with my Bladnoch experiences. Either they're pretty good or pretty mediocre. Its United Distillers era seems to have produced the good ones. But this particular cask was pre-UD, back when Inver House owned the place. So I have no idea what to expect from it. The darkest of this set's six whiskies, this Bladnoch's color is almost gold! At first the nose sniffs like a bowl of oatmeal with cinnamon and dried apricots. But then there's carob bark and carpet. Then dried pineapples and cherry sauce. Meanwhile it also has a meaty/savoury thing going on: soy sauce, Worcestershire sauce, and mushrooms. Once it's aired out for more than 20 minutes it sheds everything but fruit and spice. Think cardamom and mango. The palate starts off decently. Whipped cream, strawberries, cream of wheat, milk chocolate, and caramel. Then whoooosh, those notes vanish by the third sip. A bright bitter note remains, followed by carpet fibers, and an edgy off note similar to yesterday's Glenallachie. It's admirably un-sweet, but it's also un-good. The finish has that decent start for the first two sips. Milk chocolate, caramel, and lots of salt. But subsequent sips leave behind only cardboard and over-steeped black tea. Um, okay. Some water perhaps? The nose has become quite faint. There's some of the cardamom and mango. Maybe some lychee, honey, and cilantro. Roses? The palate is cardboard dipped in sweet cream and over-steeped tea. Kinda barley-ish at times. There's nothing but mleh in the finish. Endless mleh. The nose is strange, but grows enjoyable when it settles down. Though as the nose gains focus, the palate goes to seed. Completely. It's fair to call the resulting finish terrible. Even though the whisky has its positives, I'm going to be extra tough on it because it's never balanced and I'm still having sense memories of the finish's crapulence. And if I can't drink the damned whisky, then what good is it?